Who doesn’t love dolls? Apparently plenty of people who come through Saarinen House and comment on the two dolls enjoying pride of place in the Cozy Corner. The first response is often “What are those?” The second “What is she looking at?” What indeed. These are two vintage dolls, boy and girl, that Loja and Eliel Saarinen had in their possession and who now sit on the carpeted bench in the sitting alcove or “Cozy Corner” of the Saarinen House studio. Dolls in Saarinen House. Photograph by James Haefner, 2015. 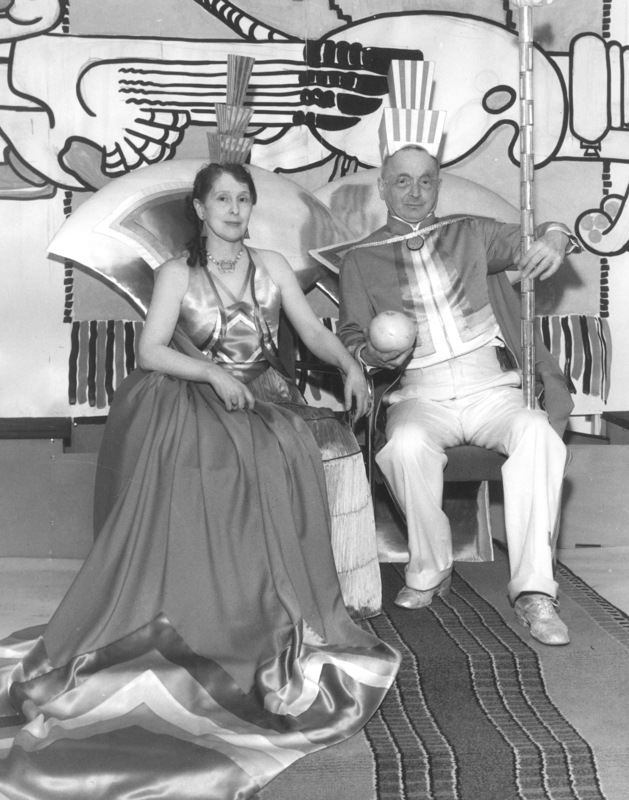 They were in place in 1947 when Margaret Fish, then art critic from the Milwaukee Sentinel, came to Cranbrook to interview Saarinen as he embarked upon plans for Milwaukee’s war memorial. [Saarinen Cites Keynote for City’s War Memorial. February 22, 1947.] Saarinen confessed to Fish, “Unless your home belongs to your spiritual as well as your physical life, you are entering among strangers.” He went on to explain that the dolls had belonged to his own children (Pipsan and Eero) and that his grandchildren played with them when they came to visit. The dolls made their way back as a gift from grandson Ron Saarinen Swanson to the house as restoration neared completion in 1994. Greg Wittkopp, then Curator of Collections at Cranbrook Academy of Art Museum, accepted them in a letter of thanks writing “These dolls are critical to the restoration of Saarinen House as they help us interpret [the house] as a ‘home’ not merely an architectural space.” Interesting that this is still the object of the set up of the house and now also of the changing exhibits within curated by current Collections Fellow Kevin Adkisson. The girl doll was made by the Italian company of Lenci founded in 1918 by Elena König Scavini (1886-1974), nicknamed Lenci, and husband Enrico in Turin. According to the appraisal by the Berkley Doll Hospital, our girl was probably created in 1920. Lenci dolls became famous for their high quality and cost and the eyes looking away. One wonders what little girls had to do to get the doll to look at them. Our doll has a felt, jointed body with painted features on pressed felt and those famous eyes looking off to the right. Her hair is a mohair wig, “intentionally tousled” in “little girl fashion” and her clothes are made of felt. Her cheeks swell in petulant child fashion and her third and fourth fingers are sewn together. 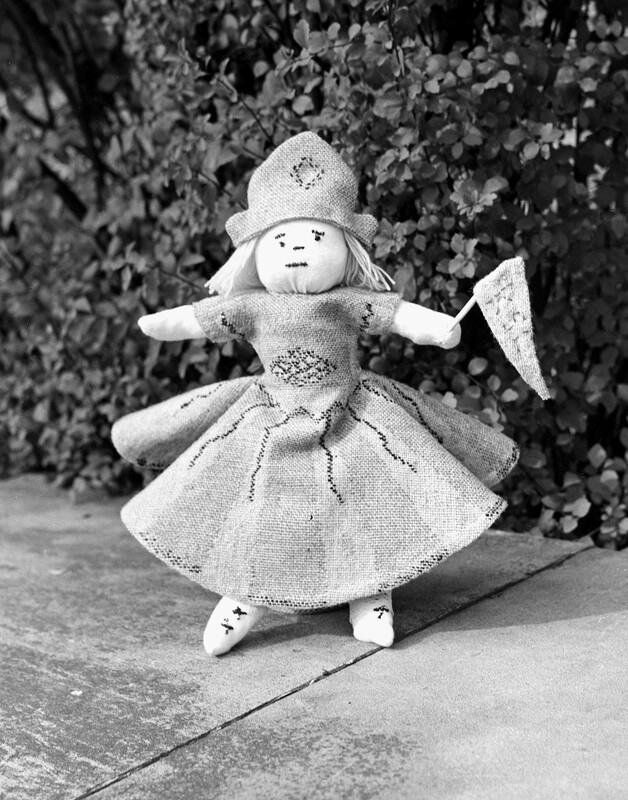 After World War II, the company changed hands and the dolls themselves evolved, becoming known as Lenci-type dolls. Identical Käthe Kruse dolls dressed in different outfits. 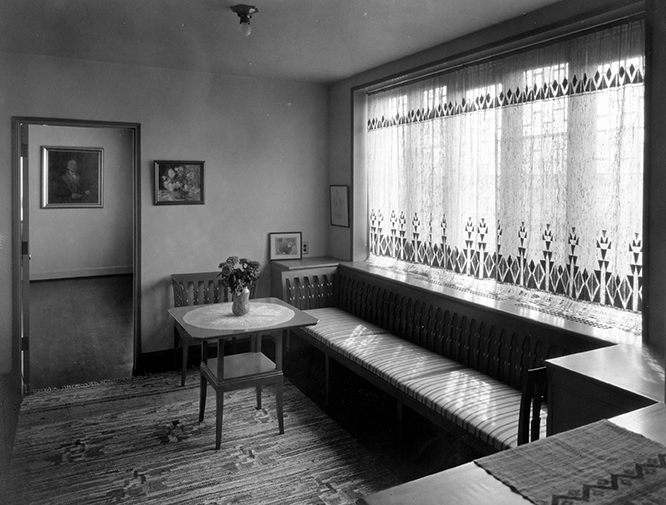 c. 1930-1940. Courtesy of Theriault and Bukowskis Auction. 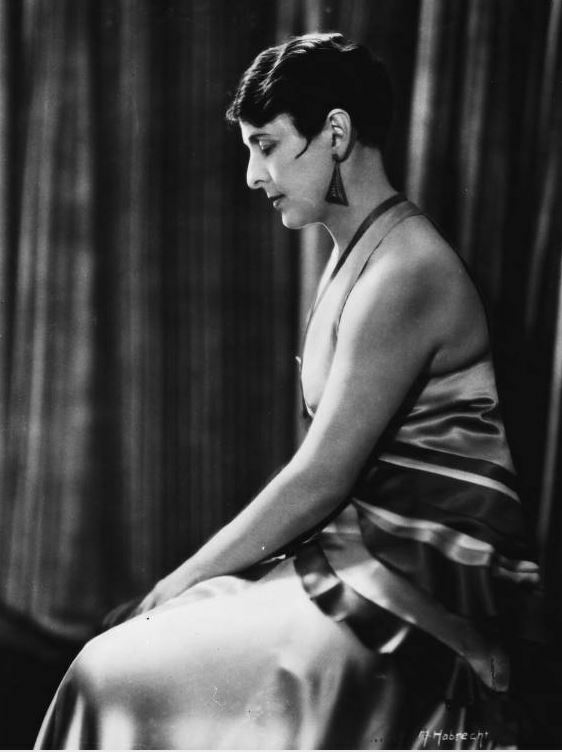 Her dolls became an unexpected hit, especially in New York where she sold 150 dolls to FAO Schwarz in 1911. 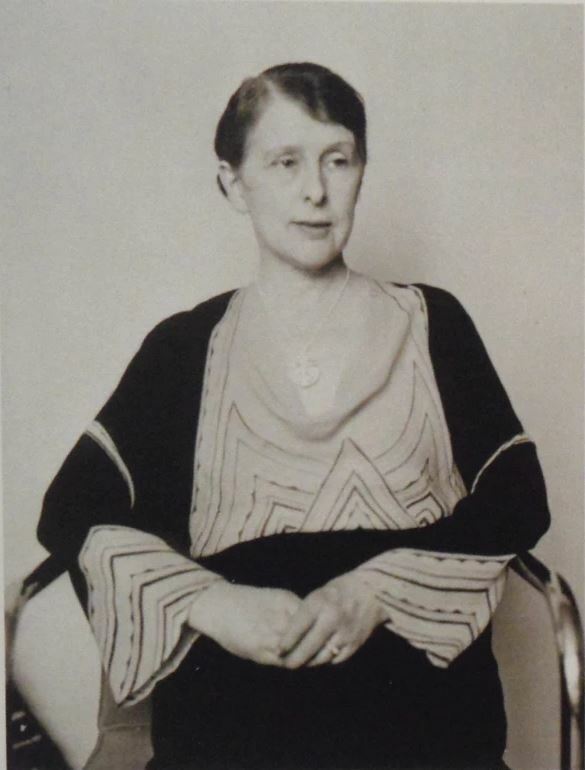 As time passed and Germany was embroiled in World War I, Kruse was pressured to join the patriotic movement catering to the increasing militarism of German society. So her doll grew into a male and appeared in a generic military uniform. So much for the little girls who might not want a soldier baby to play with. Boy and girl clothes on Käthe Kruse dolls, 1918. Courtesy of Geheugen van Nederland. Kruse’s doll was destined for further changes, however, because another war loomed, and the gender-neutral baby was once more required to grow male and don a uniform of more sinister aspect. Kruse lost two sons of her eight children to this war, and as she continued to produce dolls, their facial expressions grew decidedly sad. Who knows why Hitler or his head honchos in the midst of a war would be paying attention to a toy manufacturer, but somehow the dolls’ apparent lack of politically correct optimism attracted attention, as did the Jewish workers Kruse refused to fire, and Kruse’s workshops were closed down. No more dolls until 1946 when Kruse sent three more children to restart the manufacture. Our doll is dated by the Berkley Doll Hospital to 1910. He is the Doll 1 type with a molded muslin head and hand-painted features and hair in oils. His wide-hipped body is jointed cloth stuffed with reindeer hair, and he has the typical Doll 1, “frog” hands. His clothes are cotton and wool with a knitted wool hat and leggings. Whoever played with these dolls, they were certainly handled carefully and not loved to pieces. And yet, when Margaret Fish came to call, she reported there were three dolls “European in appearance, sitting primly on the benches.” What happened to doll number 3? Would this have been a doll of yet another nationality? French maybe? Käthe Kruse and dolls, 1905. Courtesy of Käthe Kruse History. Some visitors find the dolls creepy, others fascinating. When they come to Saarinen House, visitors do not expect to be taken back to their own childhood as these dolls will do to you, if you let them: she looking off to her right, grumpily in search of better things, and he looking sturdily down. The Kruse dolls are still in production 50 years after Kruse’s death at the age of 85, still desirable, still looking a bit like baby Friedebald Kruse, the model for the first commercial doll, and still stuffed with reindeer hair if you are willing to pay. 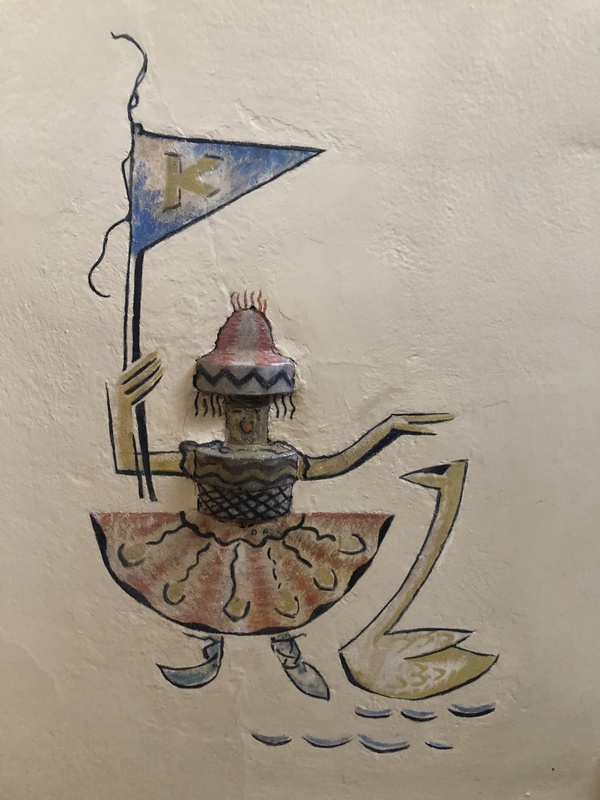 You can see the Saarinen dolls on Saarinen House tours, led by the Cranbrook Center for Collections and Research Collections Interpreters every Friday, Saturday and Sunday, May-November. As the fountains around Cranbrook are drained and the chilly air sets in, I thought we could warm up with a little molten iron. In 1962, Julius Schmidt was appointed artist-in-residence after the departure of Berthold “Tex” Schiwetz from the Sculpture department. 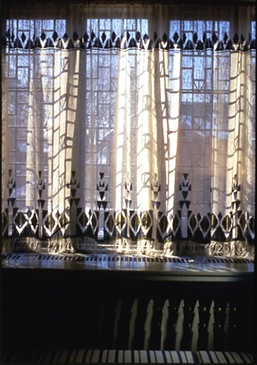 Schmidt received his BFA from Cranbrook in 1953 and his MFA in 1955, working under Schiwetz. Schmidt worked almost exclusively with iron, a rough and difficult material previously unexplored at the Academy. 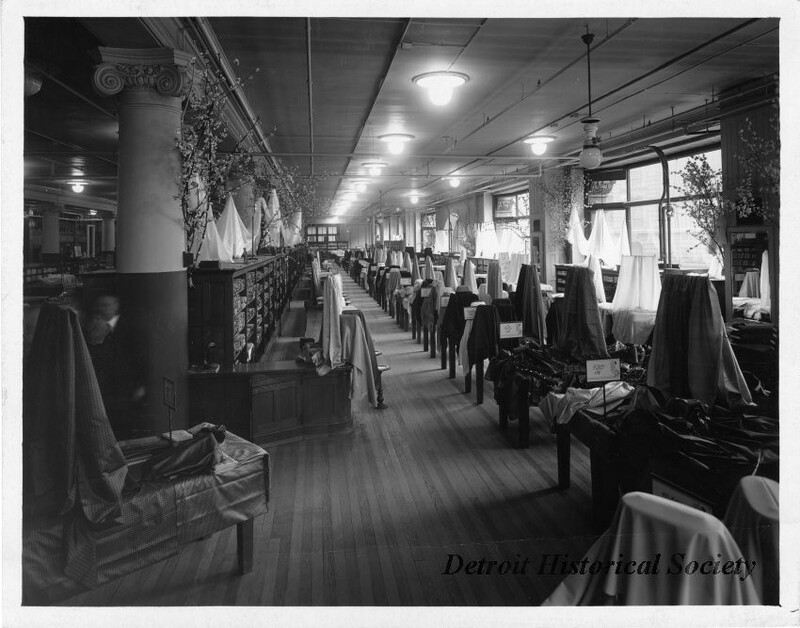 Early in his tenure, he set about raising money from Detroit-area tool and die companies to build Cranbrook a foundry. Iron pour in the new foundry, November 1965. Paul Reuger, photographer. Constructed in the open space to the east of Carl Milles’ large studio, the concrete block and glass curtain wall forge building was the first physical addition to the Academy campus since Saarinen died in 1950. Julius Schmidt, Head of Sculpture, (center) with students at commencement, May 1966. Harvey Croze, photographer. 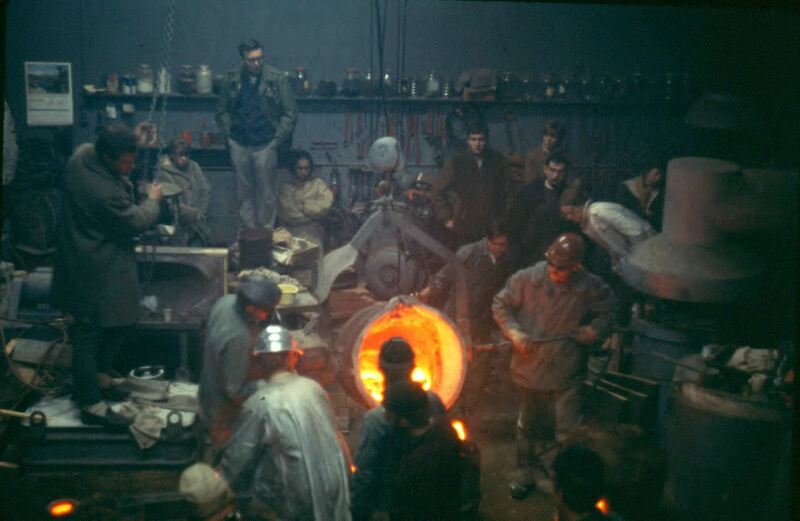 As reported in the 1964 Cranbrook Academy of Art News Letter, the new foundry featured six furnaces capable of casting up to 1,000 pounds of molten iron or bronze. The foundry also included electric hoists, a bridge crane, grinder, mueller, electric oven, acetylene and arc welding equipment, and pneumatic grinding and finishing tools. Schmidt and some students used the forge extensively for their work, perhaps to the disadvantage of students who didn’t want to work with iron. 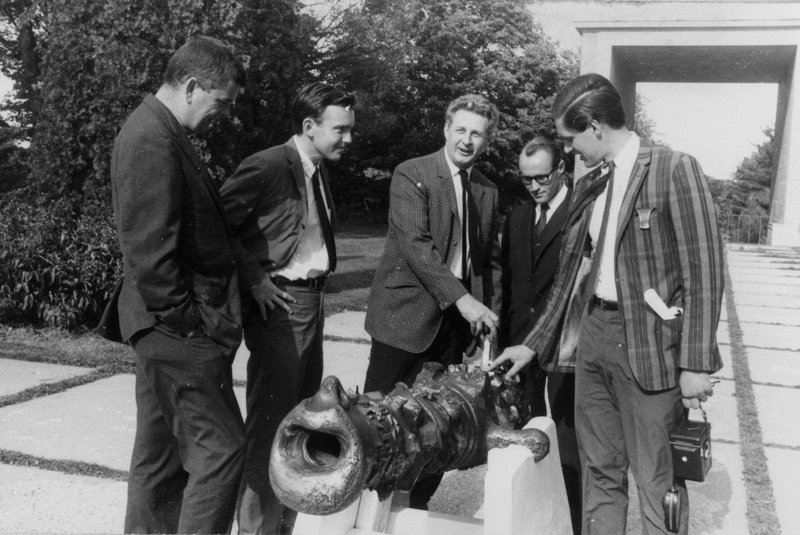 In 1966 students working under Schmidt designed, sculpted, cast, and then fired a cannon featuring a caricature of Zoltan Sepeshy’s nose and mouth. Schmidt left Cranbrook in 1970, and I can’t find evidence of iron pours after his departure (today, students who wish to cast their own iron participate in an annual pour at the College for Creative Studies.) In the forge now is the Academy’s metal shop as well as equipment for 3D printing, laser cutting, and vacuum forming–all situated around the forge equipment. 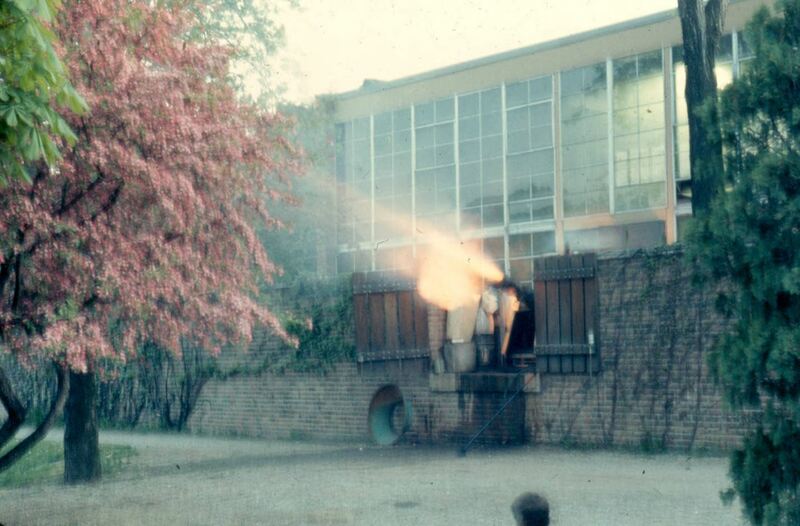 Cannon being fired out of the foundry, May 1966. Paul Rueger, photographer. 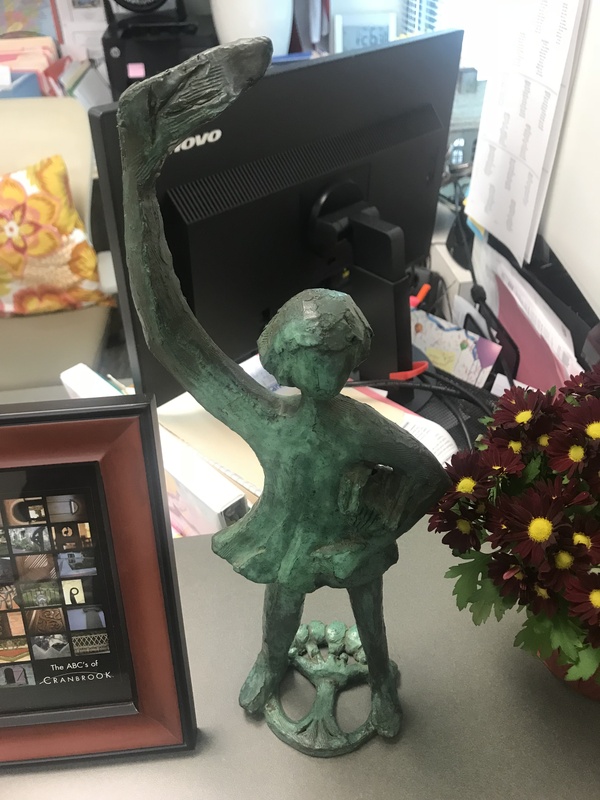 If you would like to visit the foundry, join me on the Behind-the-Scenes tour: Saarinen House: Presidents/Residents, next Saturday, October 27th. This is the final date for this tour that includes a visit to the exhibition at Saarinen House, the studio space of Wallace Mitchell, the foundry, Cranbrook Archives, as well as several other stops. Click here for more information. 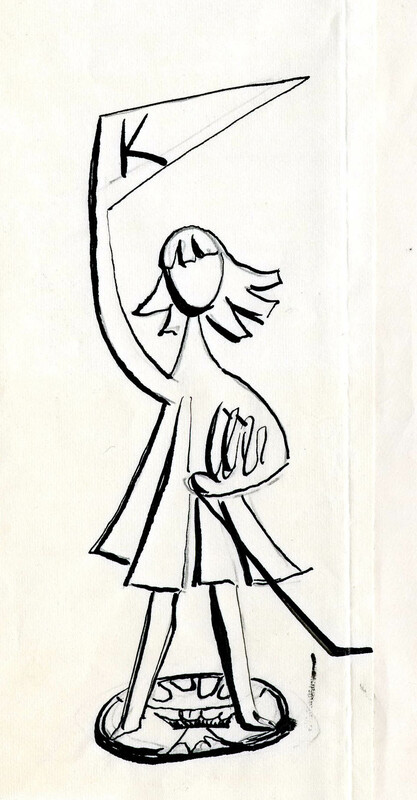 Cranbrook Archives is excited to announce the opening of the Ralph Rapson Collection (1935-1954) for research. The collection focuses on the early years of Rapson’s work, including his time as a student at Cranbrook Academy of Art. Rapson’s later work is retained at the Northwest Architectural Archives at the University of Minnesota, where he was the Dean of the School of Architecture from 1954-1984. 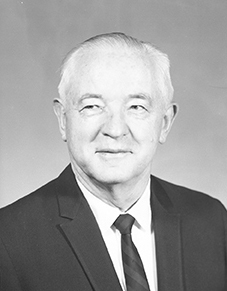 Rapson was born in Alma, Michigan in 1914. He earned Architecture degrees at the University of Michigan (1938) and at Cranbrook Academy of Art (1940). Upon completing his studies at CAA, Rapson set up his studio and was invited to help Eliel Saarinen with a planning project, which was to provide an analysis of the site for a new State Capitol complex in Lansing, Michigan. Following this experience, Rapson decided to focus more on architecture than planning. Between 1938 and 1942, Rapson contributed designs and drawings, and built models, for various projects and competitions for Eliel Saarinen and his associates. Rapson (left), with Eero Saarinen and Fred James working on a competition drawing for the Festival Theatre at the College of William and Mary, 1939. Rapson (right) plays football with Academy students at Cranbrook, Sep 1939. While at Cranbrook, Rapson collaborated on several competition drawings with Eero Saarinen, Frederick James, David Runnells, Walter Hickey, Harry Weese and others. Rapson established an early reputation for his experimental concept houses like the 1939 “Cave House” and “Fabric House,” (both designed at CAA with fellow student David Runnells) and the 1945 “Greenbelt House” or Case Study House #4, one of the experiments in American residential architecture sponsored by Arts & Architecture magazine. Case Study House #4 for Arts & Architecture magazine, Jun 1944. In the early 1940s, Rapson moved to Chicago where he taught under the Hungarian Bauhaus artist, Laszlo Moholy-Nagy. Rapson served as Head of the Architectural Curriculum at the Institute of Design (New Bauhaus) from 1942-1946. He left this position late in 1946, when MIT Dean of Architecture, William Wurster, invited him to relocate to Massachusetts where he taught architecture alongside Finnish architect, Alvar Aaalto. Design for the Hageberg house, 1939. Rapson and Maholy-Nagy’s design for the U.S. Gypsum Company booth at a national builder’s convention, 1945. 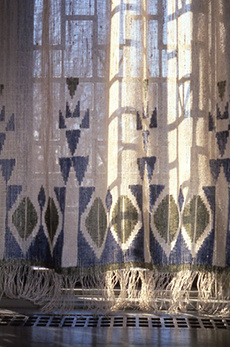 A design with Van der Meulen for the Dugan residence, 1946. In 1951, Rapson was hired by the U.S. State Department to design a series of American embassies in Western Europe with architect John Van der Meulen. Rapson worked on several embassy projects, as well as residential projects, in the mid-1950s. 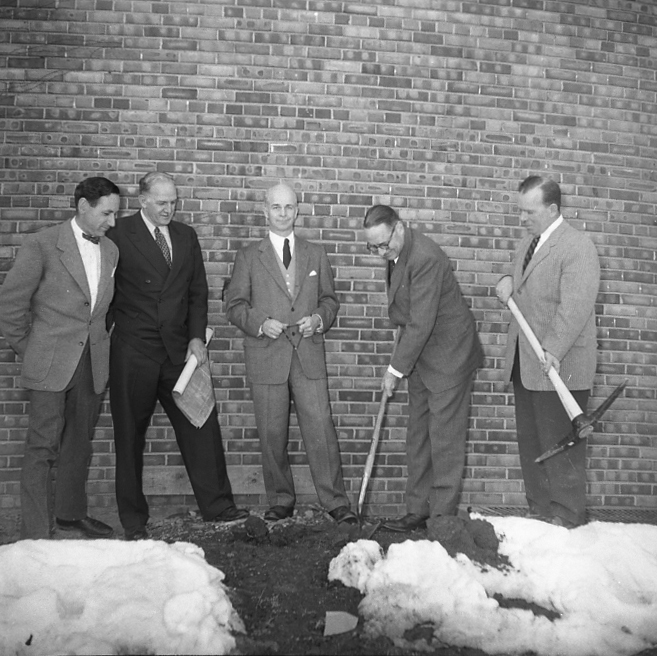 In the spring of 1954, Rapson and his family moved to Minnesota where Rapson served as the Dean of the School of Architecture at the University of Minnesota from 1954-1984. He continued to work in private practice in Minneapolis until his death in 2008 at the age of 93. 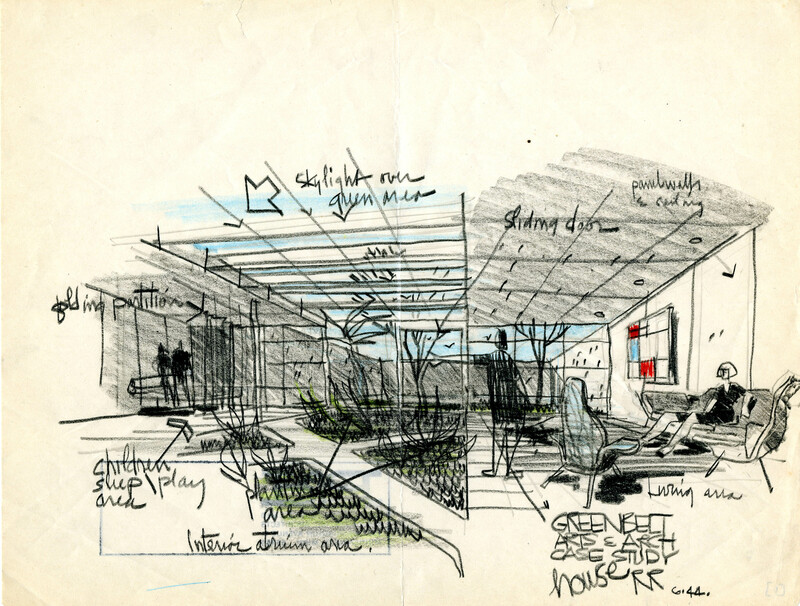 The Ralph Rapson Collection includes project files, research, correspondence, architectural drawings, and photographic material from many of Rapson’s embassy projects, as well as design competition materials and residential projects. In addition to the physical collection, a digital site (including drawings, photographs, and ephemera) is now accessible from our web site. The Archives staff will continue to add to this site, as more material is digitized. Hession, Jane King, Rapson, Rip, and Wright, Bruce. Ralph Rapson Sixty Years of Modern Design. Afton, MN: Afton Historical Society Press, 1999. Heyer, Paul, ed. Architects on Architecture. New York: Walker and Co. 1965. Nearly every day I run across some previously unknown person or event relative to Cranbrook’s history. My latest obsession is with a Chinese wall painting purchased in 1939 by George Booth for the Art Museum’s collection. 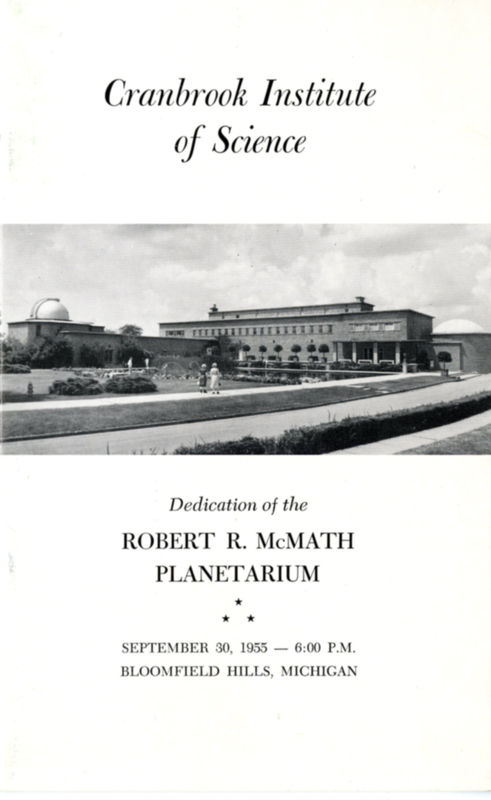 Sadly, it is no longer in our collection, but the story is quite interesting nonetheless. 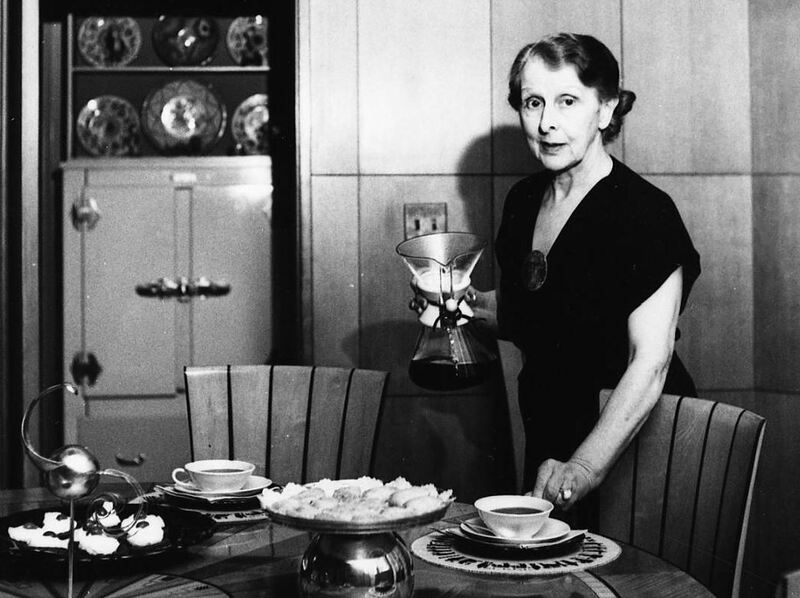 As early as 1916, Booth was acquiring Chinese objects from the Japanese dealer Yamanaka & Company, and soon after from Duveen Brothers and the Parish-Watson Company in New York, Spink & Son in London, and Gumps in San Francisco. As was customary, dealers maintained a relationship with their clients via letters often suggesting objects they might be interested in and including photographs and catalogs. 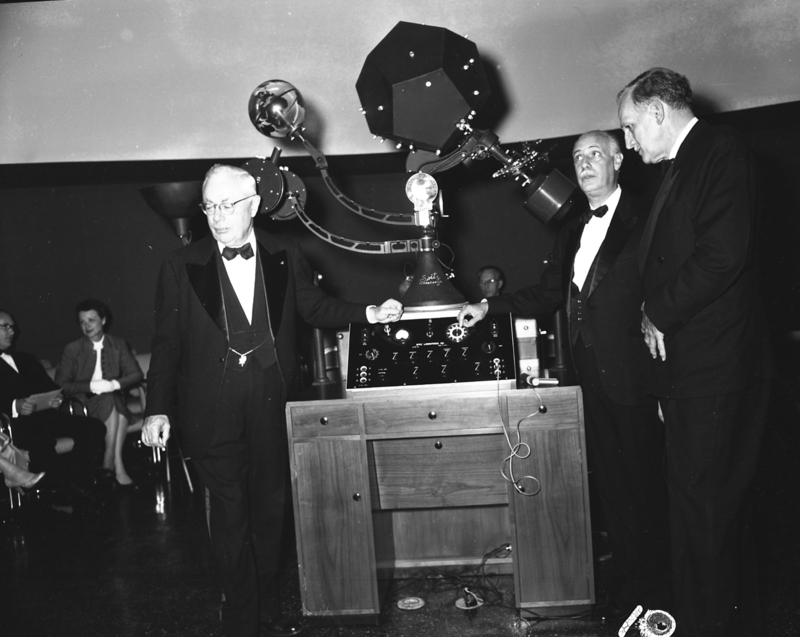 In 1939, Booth began a relationship with the well-known Chinese dealer, C.T. Loo, who had offices and gallery space in both New York and Paris. Bodhisattva from the Five Dynasties Period. Cisheng Monastery, Wenxian, Henan Province, China. You can clearly see where the wall painting had been cut into three sections in order to remove it from the temple. Loo was widely considered one of the most prominent, and controversial, dealers in Chinese art and artifacts in the early twentieth century. Loo traveled annually to China to hand-pick the objects he wanted, many of which were chiseled out of or pilfered from ancient Buddhist Temples and monasteries. Daisy Yiyou Wang, Curator of Chinese and East Asian Art at the Peabody Essex Museum in Salem, Massachusetts, and the pre-eminent scholar of Loo, stated “he is remembered as a culprit for the depletion of the nation’s cultural heritage.” Loo justified his practice by stating that he was preserving China’s history by getting the objects out of China – that the Chinese couldn’t or wouldn’t take care of them! 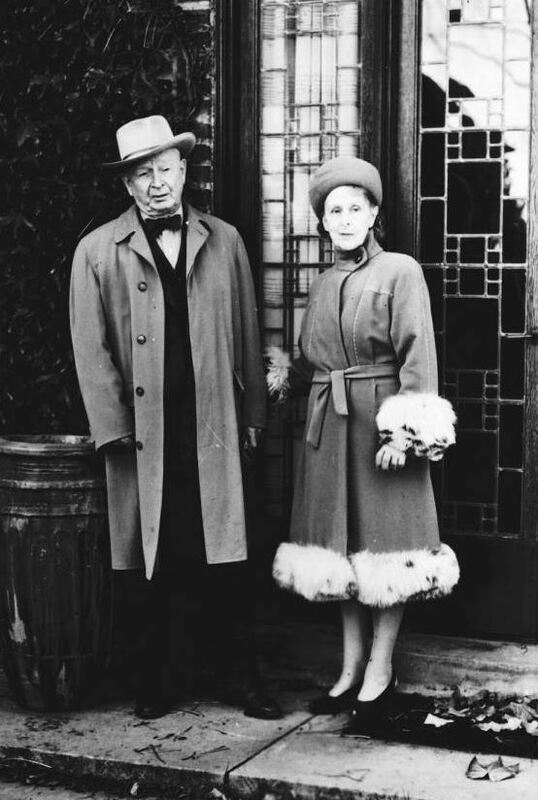 In 1915, after a visit to the U.S., Loo opened a gallery in New York. His first sale was to Charles Lang Freer. The three sections were shipped to Paris and reassembled by restorers there. Booth’s first interaction with C.T. 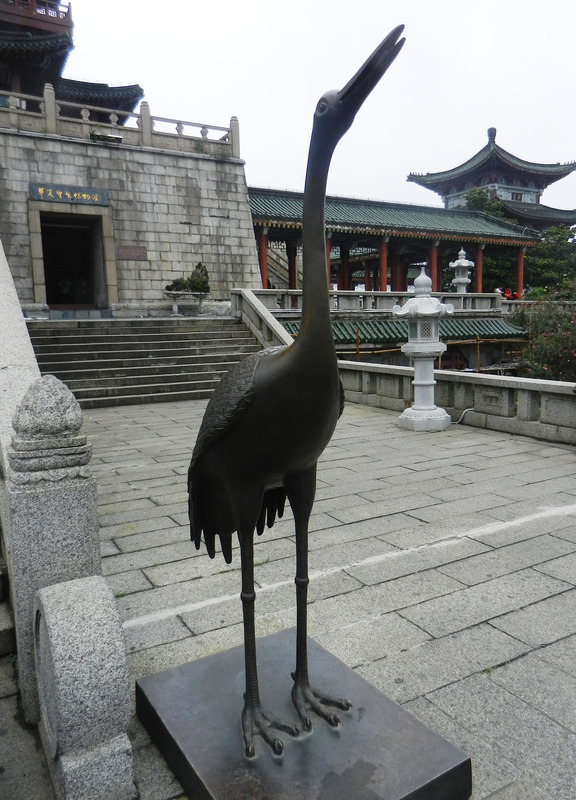 Loo came in the fall of 1939 when he acquired two Chinese bronzes. In correspondence about the bronzes, Loo also suggested to Booth a large “fresco” (or wall painting) which stood thirteen feet tall. 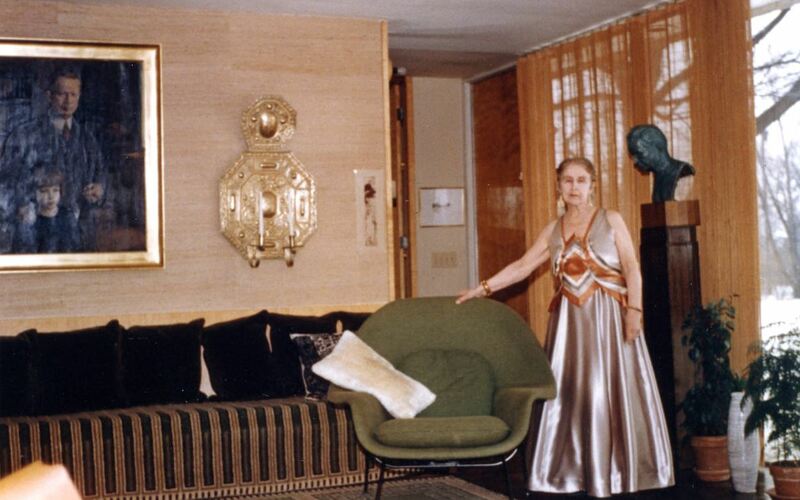 After consultation with Eliel Saarinen, Booth acquired the work, which arrived in January 1940. In December 1941, John Gettens of the Fogg Museum examined the painting and found it to be in generally good condition. 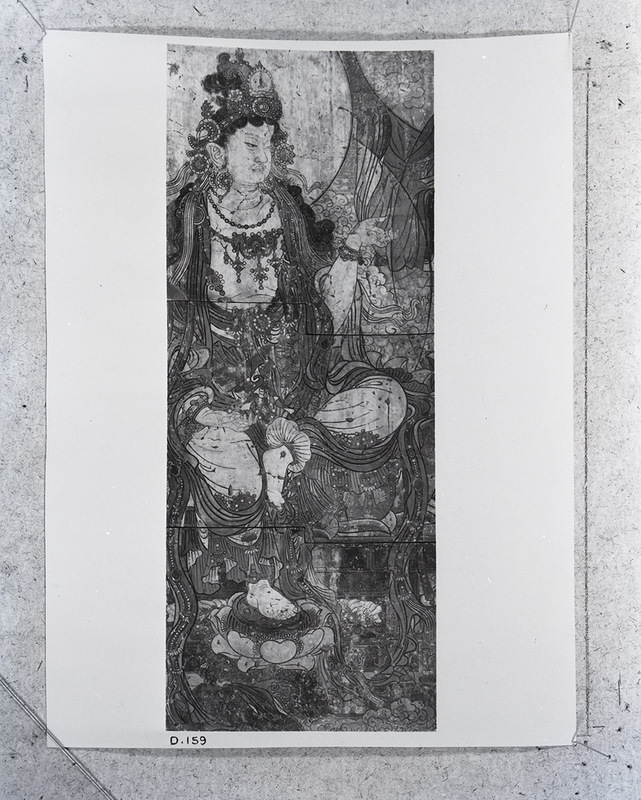 It was of the “usual mud wall of Chinese temple paintings” which included organic matter – straw, seed hulls, and rice. It was covered with a very thin white coating of kaolin, and the colored pigments were malachite, azurite, red iron oxide, yellow ochre, vermilion, and white clay. The painting hung in the main gallery of Cranbrook Art Museum for more than thirty years. In 1974, the Museum Committee unanimously decided to sell the painting instead of pay the $5-6,000 to have it restored. Funds from the sale were to go towards the care and restoration of other works in the collection, as well as for renovations to museum storage space. 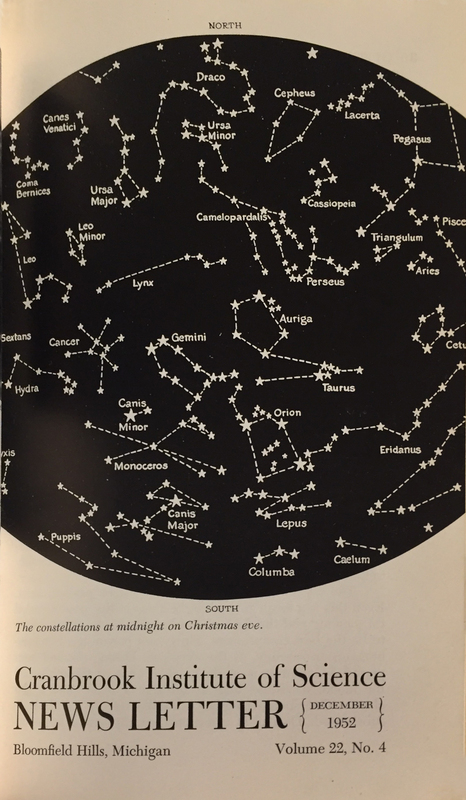 Tracing which shows the location of small areas of in-painting by Cranbook’s Marshall Fredericks, October 1941. Courtesy Cranbrook Archives. Thus ends the saga of the Chinese temple wall painting at Cranbrook as we do not know its whereabouts today. Other temple paintings can be found in the collections of the Art Institute of Chicago, Nelson-Atkins Museum of Art in Kansas City, Princeton University Art Museum, and the Toledo Museum of Art. In a grassy meadow (once called “Frisbee Valley”) at the bottom of Suicide Hill is a line of boulders – a sculpture colloquially known as Snake Rock. 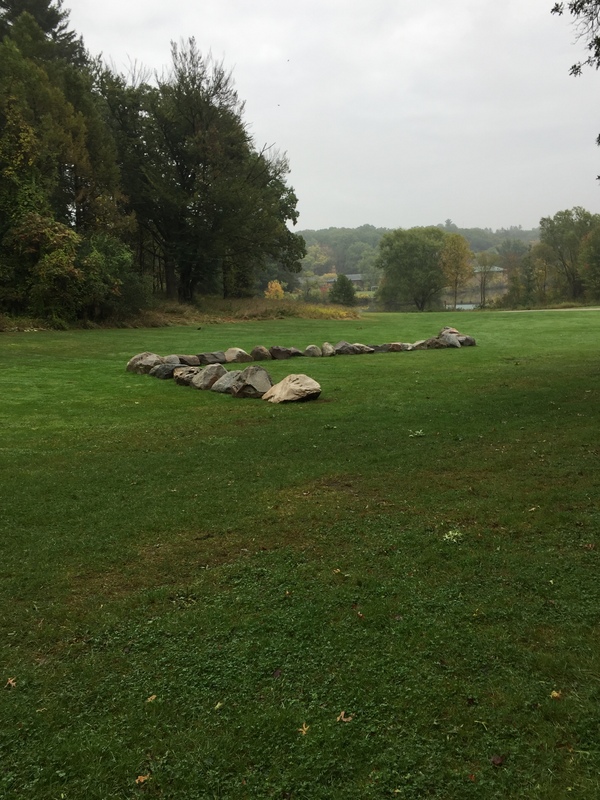 Actually titled “Lucifer Landing (Real Snake in Imaginary Garden)” or Lucifer Landing for short, the sculpture was designed by American artist Richard Nonas using thirty-nine boulders which zigzag in a serpentine line. One could describe the boulder with the sharp-angled end as resembling the head of a snake, while the rest of the boulders (relatively the same height as each other) taper to the tail section, which appear like rattles. While some think the boulders, which weigh a collective seventy tons!, were found on Cranbrook’s grounds, they were actually acquired in Clarkston, Michigan and represent a cross-section of the type of rocks deposited by the glaciers in Oakland County. Richard Nonas, 1989. Courtesy Cranbrook Archives, Jane Knirr photographer. Nonas was invited by Cranbrook Academy of Art’s Head of Sculpture, Michael Hall, to join other major artists like Alice Aycock, Mark DiSuvero, Dennis Oppenheim, and Robert Stackhouse in exhibiting temporary sculpture installations across campus. Funded by the Academy of Art Women’s Committee and Gilbert and Lila Silverman, Lucifer Landing was installed in 1989 – the first sculpture to be placed on campus since the 1970s. Twenty Academy of Art students helped put the boulders in place. Trained as an archaeologist, Nonas was known for sitting abstract works in wood, stone, or metal directly on the ground. 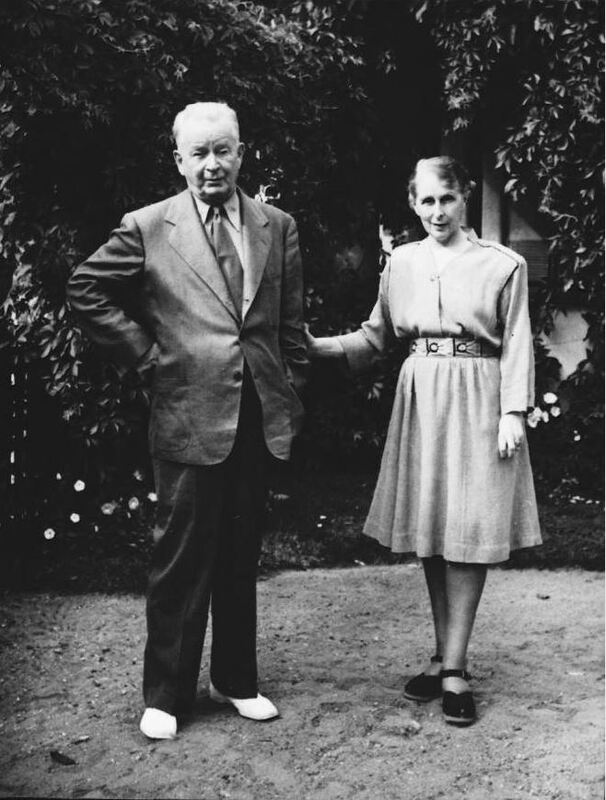 He said “it amused me to place something at Cranbrook that [Eliel] Saarinen might have seen as a child in Finland. 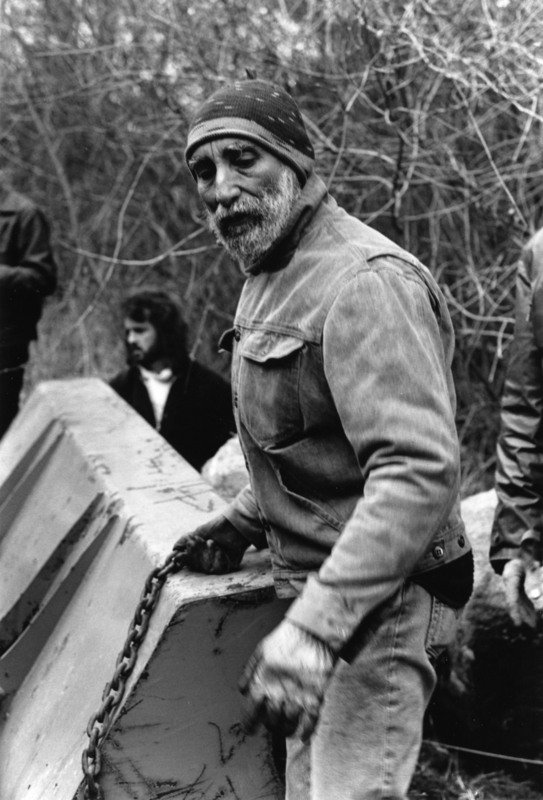 There are prehistoric stone monuments near his boyhood home.” While working on the sculpture, Nonas developed a great respect for Cranbrook’s sense of place, and wanted to construct a small form that changed as you walked by and around it – a “sculpture that activates its space, that confuses you a little, keeps you involved in it as you walk past it.” A form that looked almost natural but really couldn’t be. Lucifer Landing, October 2017. Photograph by the author. NOTE: For an excellent article “A Mark of Place: Lucifer Landing Past, Present and Future” on the mistaken dismantling of the sculpture in February 1999, see The Crane-Clarion’s June 1999 issue. Cranbrook Kingswood senior and associate editor Erica Friedman discussed the Cranbrook landscape and how we must face the “problem of destruction passing for progress” – a topic many Americans, including those at Cranbrook, continue to face today.